Picking out sunglasses: why bamboo? Things like plastic waste, landfills and our health choices are not the first things that come to mind when we’re perusing the shelves for a pair of sunglasses. However, with over 15 million pounds in fashion-related waste being produced by North America alone, you might want to consider your buying habits when it comes to shades. A 10-dollar pair that snaps from being sat on once can leave your eyes exposed to UV rays (especially if it never protected them in the first place), and wind up in a landfill or the ocean, the last places we want more plastic waste making a mess of mother nature. On the bright side, the rise of bamboo in fashion and accessories is making ecological, not to mention stylish, strides. When you take a look at bamboo compared to a lot of other plant resources, it almost seems like it has environment-saving superpowers! According to Discover Magazine bamboo stalks are naturally resistant to pests, and common plant diseases. This means that using bamboo for our glasses instead of plastics that draw on cotton plants keeps nasty chemicals out of our soil and water systems. Speaking of which, bamboo requires extremely little water and has even been known to flourish during droughts (yet another reason why it is such a low-resource crop); it grows at alarmingly fast rates and does not require farmers to replant after harvesting. While all these characteristics help reduce the amount of land needed per business, keep harmful chemicals out of landfills, and save on water use (the fashion industry otherwise uses far too much), they also explain a lot of the reasons why bamboo sunglasses benefit you on a personal level. 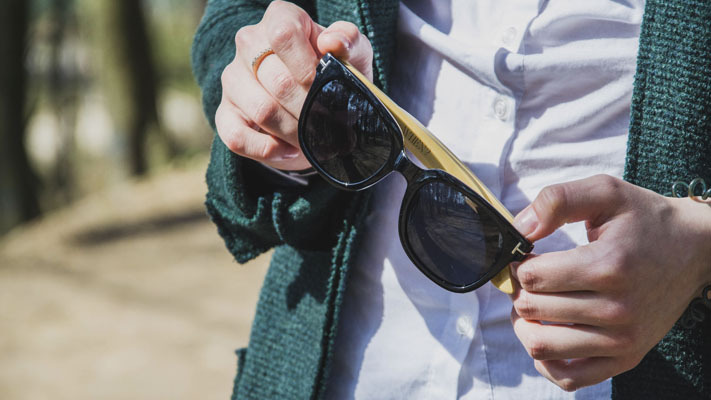 One of the first perks when it comes to bamboo sunglasses is the level of durability. Bamboo fibres are springy and super solid, which means they don’t bend out of shape or break as easily when hit with everyday wear and tear. While this sounds heavy duty, bamboo materials are naturally wonderfully light. That means you get to lose that annoying red mark on the bridge of your nose that denser plastics and metals push onto your skin after a day of wear. If you have sensitive skin, or are prone to reactions to things like metal, or the chemicals in commercial plastics, then search no more! Bamboo is naturally hypoallergenic, and the lightweight nature means less chance of causing irritation as you sweat against them, or they heat up in the sun. All in all, we think those benefits are some really good reasons to try out a pair of bamboo sunglasses, and also to seek out bamboo in a lot of other sections of our favourite shops too. Our health and comfort, and the earth under our feet are some of the most important things we have, so why not! Maurice is a Creative Industries graduate (almost) at Ryerson University with a love for city-living, summer, and organic skin care that keeps his health at the forefront. Hobbies include indoor gardening, film photography, and of course, shopping.